It is not recommended to place the skyline or water surface in the middle of the picture – such construction aims at dividing the picture in two independent parts, and confuses a viewer, trying to determine, which part of the picture is more important. The picture might also fall to parts in case there is a tree (a pole) at the center of the frame and, accordingly, the line of changing the brightness, color, or a corner of a house. Except it is a conditional idea of a picture. Try to make the main object of the picture not blend with the background. Try to single out the main object using the direction of sunbeams (shade), the camera position, limiting clearly represented space or choosing a contrast color of the background. Avoid large empty spaces, such as clear blue sky, dull monotonous plain or smooth water surface. Try to find something to fill in the empty space, as, for example, a hanging twig or a cloudlet. Build the picture cornerwise. Do not do it if the horizon or, for example, the building will look strange. A diagonal composition with left-down direction to right-up is calmer, than the one built on the opposite, more dynamic diagonal. Observe horizontal position of water and sailing ships. Slope of water surface is not pleasant for eyes. Try not to incline the buildings. First of all, one has to hold the camera evenly. Secondly, if you shoot with a short-focus – 28mm lens (in order to make fit in more things), then you have to remember about distortions and about the fact that if you bend the camera up or down, then distortions increase. Setting of the subject (frame). Use twigs, trees, etc. in order to create a frame effect, and thus emphasizing the main object. Use this method also for filling empty dull space of the sky or for conceiving undesired spots of the picture. The frame can also help in creating a more volumetric picture (in the form of some ground). Do not make the frame the main notional element. Fill in the picture with the subject. Come up as close as possible. Use zoom. Make your object maximally large. This allows the viewer single out the main object in the picture right away without continuous travel around the picture. 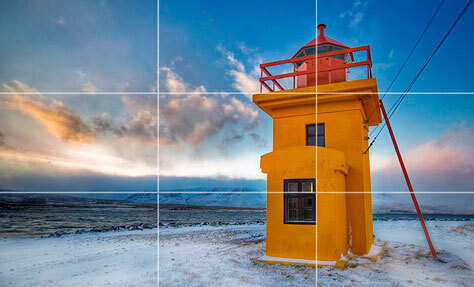 Try to observe a balanced composition, so that the upper part of the picture looks heavier, than the lower part. The same refers to the sides. Don’t be lazy to lower yourself, taking pictures of children and animals. Take photographs from the height of their heads. Do not photograph directly from the bottom upwards or from your height downwards, with the exception of cases, when you attempt to achieve special effect. In any case pay attention to the background. Watch that the skyline or other lines of the background do not cross the head. When photographing a portrait keep in mind that eyes are usually very important. That is why they must be very clear at the picture. If you face difficulty in “catching” the eyes, you can focus on the upper button of the collar, which in most cases coincides with the level of eyes. When you photograph motion (a running man) leave him space for motion, i.e. place the object as if he has just entered the picture, and is not leaving it. The composition will seem more dynamic, if the picture was composed from right to left. Avoid bright lights or many-colored spots aside from the main plot. This diverts a viewer. Photograph volumetrically. For example, a view of a building, allowing examine its front and the side part better, than just the front. Include into the plot subjects of the foreground – a branch of a tree, a postbox, etc., even if they look not clear. Catch a beautiful sky. Faded white and covered with clouds sky or clear blue sky doesn’t always look attractive enough. Often the scene looks much better with fluffy rare cloudlets. Of course, this means the necessity to wait, or even coming the next time in order to make a beautiful picture. Pay attention to shadows. Although shadows might seem light and transparent for the naked eye, in the picture they will look much heavier, than you remember the scene. One can use filling flashlight for softening the shadows.